For several years Theta offered the Mind’s Eye light and sound mind machine, also known as a dream machine, brain machine or psychowalkman. The Mind’s Eye was an easy-to-use system that offered 50 brainwave frequency sessions, had Polysync capability and could interface with the Mindplace Thoughtstream biofeedback system. The Thoughtstream is still manufactured by Mindplace today, along with the Proteus, Procyon and Kasina Mind Media mind machines. The Theta Mind’s Eye offered four different sound selections, including binaural beats, binaural beats synchronized to pulsed lights, adjustable pitch control with soft on / soft off capability at the beginning and end of each brainwave frequency session. The Mind’s Eye was a very effective brainwave entrainment mind machine that was built to last a lifetime. The Voyager XL mind machine by Theta Technologies was used by the medical and educational communities as an effective and beneficial means of producing brainwave entrainment for the purposes of promoting mental, emotional and physical wellness, memory retention and reducing stress and anxiety. The Theta Voyager XL mind machine generated brainwave frequencies in the Gamma, Beta, Alpha, Theta and Delta frequency ranges, affecting all general brainwave states of consciousness. 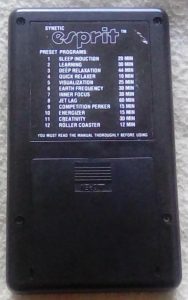 Theta Technologies’ mind machine, also known as brain machine or psychowalkman, was a high-end system at a mid-range price. The Voyager XL bears a strong resemblance to the Mastermind by Synetic Systems (now known as Mindplace), the forerunner of the Proteus, Procyon and Kasina Mind Media systems that are so popular today. 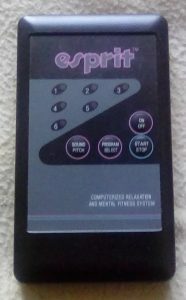 This mind machine produced several types of brainwave stimulation including binaural beats, possessed adjustable session length of time and included session selection parameters not found in similarly priced mind machine entrainment generators. Theta Technologies was based in the state of Washington and offered several mind machines and CES (cranial-electris-stimulation) instruments.